Send in the clones! Intel's itty-bitty Core i5-powered Next Unit of Computing caught our eye late last year by providing desktop-class power in a barely-there package that's so small, you could easily slip the entire computer into your jacket pocket. The combination proved so succulent that the NUC landed in PCWorld's top 50 products of 2013, despite being a fairly pricey system devoid of memory, storage, and even an operating system. Clad all in black, the Brix GB-BXi7-4500 bears a striking resemblance to Intel's micro-PC, and one that goes more than case-deep. 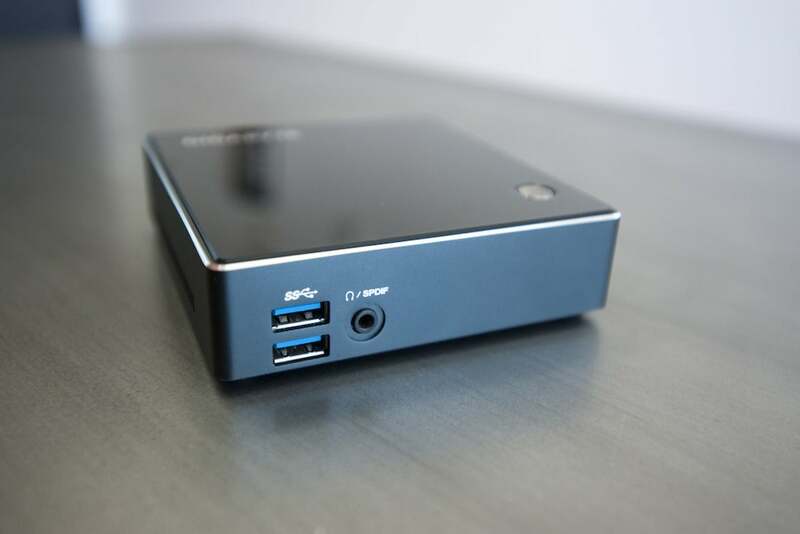 Like the NUC, the Brix asks users to bring their own RAM, OS, and storage. Like the NUC, the Brix includes a VESA bracket that allows you to mount the system to the rear of a monitor and create an impromptu all-in-one PC. Heck, even the general look of the Brix mirrors the NUC in all but the tiniest details, though it ditches Intel's silver styling for a svelte, all-black design. 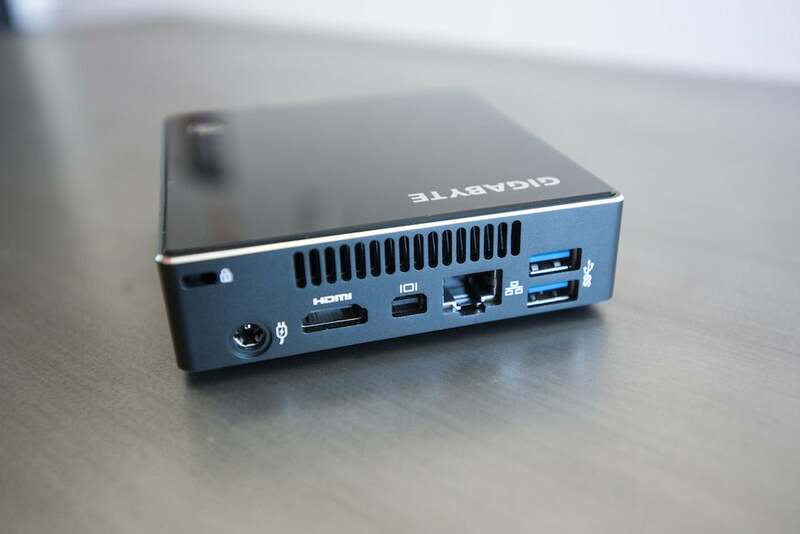 The heart of the Gigabyte Brix GB-BXi7-4500 differs from the NUC in some very important ways, however—ones that make it a very, very different value proposition. Let's dig in. Amazingly, Gigabyte's Brix actually measures in slightly smaller than Intel's NUC, though you wouldn't notice the difference unless you plop the two systems next to each other (or bust out a ruler). At 4.5-by-4.24-by-1.18-inches, this machine is tiny. Believe it or not, this simple little box has a front, and this is it. Despite its diminutive size, the Brix offers a healthy selection of ports—a selection that once again largely mimics the NUC. The front of the machine holds a pair of USB 3.0 ports, along with headphone jack that doubles as a SPDIF port. The rear of the Brix houses another USB 3.0 duo, along with Ethernet, Mini DisplayPort, and HDMI connections. You'll also find a Kensington lock slot. The Brix lacks the NUC's infrared sensor, which could be a drawback if you planned on using it as a home theater PC. Its HDMI port is full-sized, however, which is a welcome change after fiddling with the NUC's mini-HDMI connection. Let's take a step back before we look at the Brix's performance chops. Regardless of your load-out, the core of the Brix GB-BXi7-4500 remains the same for everyone. Its beefy, Ultrabook-class Core i7-4500 processor is soldered onto the tiny motherboard. (No upgrading for you!) That's a big-time (albeit mobile) processor, and it showed in PCWorld's testing gauntlet. The NUC's dual-core Core i5-4250U outpaced many of the desktops and all-in-ones we've tested recently, specialized high-end rigs aside. The Brix's dual-core Core i7 bested it in many chores. The Brix shines at everyday tasks like crunching numbers, editing images, or shifting around chunks of data, and I never once encountered an irritating bout of lag. If you want an itty-bitty powerhouse of a Windows machine, Gigabyte's GB-BXi7-4770R delivers a much better price-to-performance ratio. Beyond that, Gigabyte's microcomputer boots into Windows 8 like greased lightning—only 13.6 seconds from power-up to full-on work, one of the best times yet—and it absolutely sips energy, with power usage topping out at a mere 12.5 watts. If you're looking for a powerful, economical business PC, the Brix GB-BXi7-4500 can definitely fit the bill. …As long as you're not planning to get down and dirty with multimedia, that is. 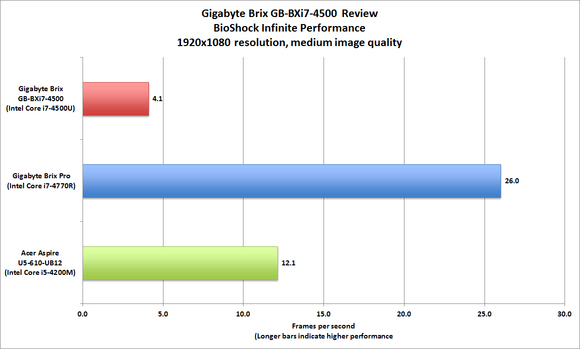 The Brix's integrated Intel HD 4400 graphics encode video at somewhat plodding rate, far behind the pace set by Intel's NUC, which has more potent HD 5000-series graphics. The Brix's audio encoding times were similarly middle-of-the-pack. And don't even think about using this as a gaming machine, though it handles high-definition video just fine. To Gigabyte's credit, the Brix never overheated, and the internal fan was consistently quiet, no matter how hard I pushed the machine. Considering the tiny size of the system and the power of its processor, that's impressive indeed. How can you tell this is the back of the Gigabyte Brix? It has vents! Intel's NUC won me over with its small stature and oversized performance, and the Gigabyte Brix is even smaller and speedier. That makes it a clear winner, right? Not so fast. Yes, you're paying a steep price premium for the small footprint and raw power of the GB-BXi7-4500, especially when you consider that you can build a perfectly acceptable home theater PC for under $500. The just-as-diminutive NUC kit costs nearly $200 less and offers more than enough performance for most people. Or you could spend $100 more and get Gigabyte's own Brix Pro GB-BXi7-4770R. That mighty mite is powered by an Intel Core i7-4770R processor and features Intel's best integrated graphics, the Iris Pro 5200. You'll still need to supply your own storage, memory, and OS, but that system offers a much more attractive price-to-performance ratio (it's street-priced just $100 higher). And if you don't need a Windows machine, there are the far-cheaper Chrome competitors popping up, like the $179 Asus Chromebox we reviewed in March. I thoroughly enjoyed my time with the Gigabyte Brix, but between its high cost and the need both to provide and install your own memory, storage and operating system, the Brix is more of an intriguing curiosity than anything else. A wonderful, powerful curiosity, sure—but a curiosity nonetheless. 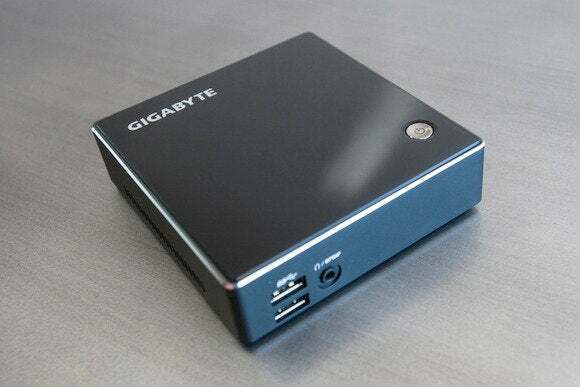 Gigabyte's Brix GB-BXi7-4500 provides a big punch in a borderline unbelievably small chassis, but the machine's price tag and bare-bones internals relegate it to "curious niche" status.